This is my post about the DIY Week Awards. If you can’t view the full post or video please click here. As you know, I love all things home improvement related and there’s nothing quite like watching people win. So I decided to soak up the atmosphere at the DIY Week Awards. It was also a great way to research what products are leading the way in the industry. 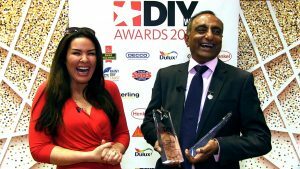 This was the DIY Week Awards’ eighth year and the best and brightest brands from the DIY, home improvement and garden sectors were there. Of course everyone wants to win, but it was a great crowd, a really fun and friendly bunch. This is a tool for cutting blocks/bricks safely, accurately and quickly. It also removes wall or floor tiles and outside wall rendering – something many of us have battled with! 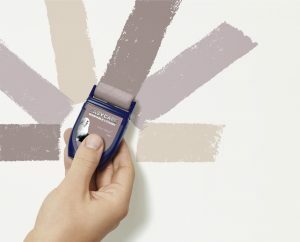 This is a mini tester roller, so you can try out Dulux paints as they will be seen when rollered onto the wall, rather than the familiar brushed on smear! They come in the ready-made Dulux colours as well as their colour-mixing range. Dulux also won the Digital Investment prize. This is as it says really! Very cool for a modern, funky garden. This is a water repelling, solvent based oil which contains UV filters to prevent weathering. It also has active ingredients to help protect wood against rot, insecticidal attack and surface mould. For someone who regularly loses her front door key, this is awesome! 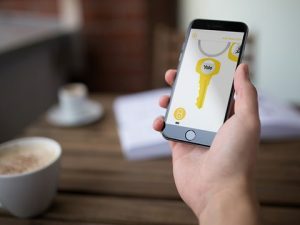 You basically use your phone as your key, but you can also give access to friends or family if needs be. 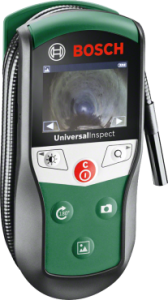 Loads of other features too – VERY exciting! This is the first of its kind in construction adhesives, it’s basically a pre-dosed mounting glue applicator. The simple (and less messy) ideas are always the best! Henkel actually won 3 awards in total. D&M Tools, Hafod Hardware, Axminster Tools & Machinery, Walton Flooring Centre, Tool Shop, Bents Garden & Home. And industry personality of the year was Vin Vara of Tool Shop. Having chatted to him I could definitely see why! 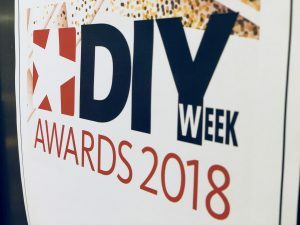 What I found really refreshing about the DIY Week Awards was that there was a real mix of the global players, as well as the more independent outfits. It really was fantastic to hear about all these innovations, helping us passionate do it yourselfers to erm…do it ourselves! Finally, for daily posts and live demos come and chat with me on The Home Genie TV Facebook page. The dulux mini roller testers are a great idea – so much better than a brush smear as you say.